My weekly dose of motivation! These podcasts are so informative and inspiring! Every episode is packed with great advice and handy tips but what I love the most is just hearing the stories of other like-minded photographers. As someone who has recently taken the decision to go part-time and start financially relying on my photography, these stories really give me confidence and belief that I can do it. It's so easy to be full of doubt in the early stages of setting up a business and hearing that others have had these same doubts and have overcome them is so reassuring and confidence-boosting. Eddie and Vicki, you guys are the absolute best! THANK YOU! It must be Wednesday as I’ve just listened to another episode of shoot edit chat repeat. So packed with useful photography tips it’s totally necessary to have a notepad on standby throughout to capture ideas (add latte/wine/gin as appropriate). Reassuring to hear others who have posed same questions/experienced same issues in their business journey too. Am a bit late to the party with my review but a heartfelt thank you to Eddie and Vicki for creating a series of informative and fun podcasts! Vicky and Eddie I love listening to you both. Love both of your personalities. You guys are what makes this podcast interesting. So much good advice. Keep it up! These 2 are lovely, funny, and smart as they share and talk to other photography industry experts - they get to the nitty gritty of what you need to know with British humour which is so refreshing - even if you've been in the business for a long time it's always fabulous to hear different perspectives - I love it! Im a new listener and I love this podcast so much! So helpful and inspiring. Thank you for introducing me to Chloe Ramirez I love her work and she spoke so much sense. Also, just listened to the Kate Griffin podcast ? brilliant! I was laughing along the whole way, safe to say I had a few funny looks on my train. Only just discovered this podcast, and loving the honesty and realness. Was feeling jaded today, and listening to your talk about your trip to LA, just brighten my day. I love this podcast - the range of guests and their different specialities has been really excellent and I there is a wealth of information for both new photographers and old hands in the industry. The natural format and fun style make it joy to listen to. I do know both Eddie and Vicki but I think even if you didn’t you’d feel like you were in the room with a couple of your good mates. Keep up the fabulous work Ladies - it’s a real joy to tune in. Always a joy to listen to and pick up lots of tips and transferable skills. Whether you're a wedding photographer like myself, or a family and newborn, or corpotate photographer, this pobcast is bound to give your creativity and marketing ideas a boost! Fun, friendly and full of helpful info! Really enjoy listening to the podcast. It feels like a fun chat with friends which never fails to draw me in. Great interviews with lots of good info and advice whatever stage you are in your photography business ? Love this podcast and look forward to it coming out every Wednesday! Vicki and Eddie are amazing, and always have you laughing AND learning. I love the personal element of Repeat Recs and the information shared is so valuable. I went to their live recording too which was amazing! Thank you Vicki & Eddie! Vicky and Eddie make it feel like I am having coffee or a wine with friends and talking about our businesses. So useful and helpful. I love love love these podcasts! Very open, informative - and hilariously down-to-earth! Discovering this podcast has been a real game changer to my photography business. So many incredible tips delivered by a whole range of talented and inspirational guests all delivered with warmth and humour. Vicki and Eddie bring a big smile to my face every week and listening to their banter is like sitting in a room with old friends. Keep up the great work! I often find myself re listening to this podcast! It's so friendly, insightful and real! I'd definitely recommend a binge listen and then following them regularly. These UK photographers have a lot of fun, interview other top photographers, and present it all in a hugely entertaining way. And you learn a lot of useful stuff along the way. Definitely recommended. 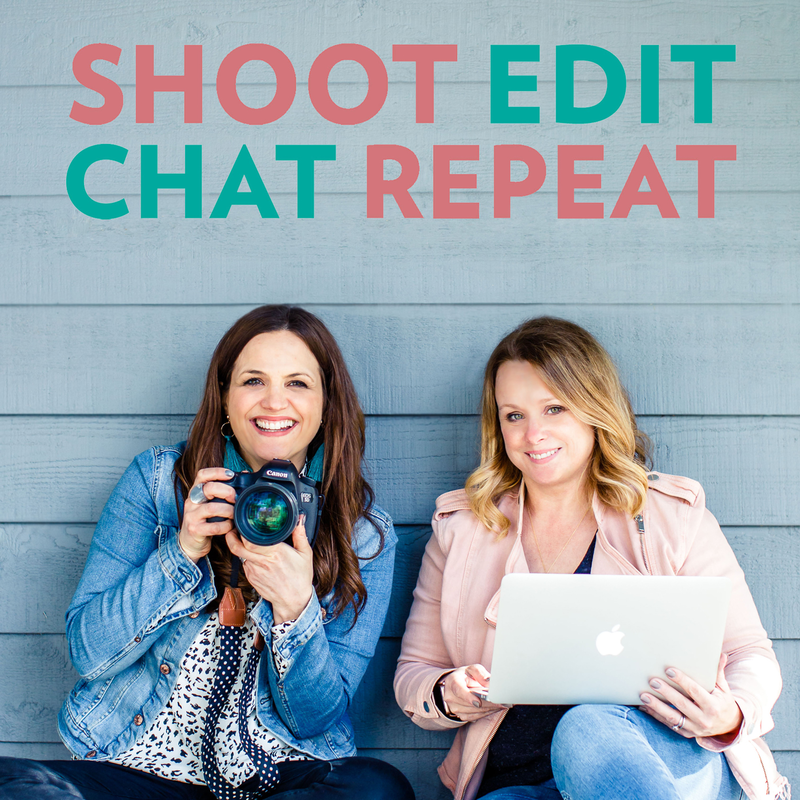 I discovered Shoot Edit Chat Repeat a few weeks ago in the desire to find a find a phtography podcast to inspire me in my new outsource editing business. Finding a UK based one was a big plus, to find one with presenters and guests that click (excuse the pun) together so well was a double bonus. I listened to the first one and knew that I would be binging on the rest to catch up. However, I'm distraught on reaching the most recent one to discover that I will have to wait until 2019 for a fresh fix. A podcast for every small business owner! I've been ten years in practice as a wedding photographer and only recently came across Shoot Edit Chat Repeat when a friend was interviewed by Vickie and Eddie. Having listened to that one episode I've been hooked ever since and am working my way through the rest of the collection. Vickie and Eddie have a fantastically engaging manner about them and ask brilliant questions. I've learnt so much from listening to their podcasts, and re-learnt a few things that I already knew to be good practice but have perhaps slipped by the wayside over the past decade. I would say that this series would prove useful whatever branch of photography you're engaged in, and beyond photography as well. If you're in the photography business, this is a must-listen-to! Let’s take our hats off, hell let’s take everything off (well, maybe not), for Vicky and Eddie who have brought a bright and shiny sense of community to us bunch of largely introverted creatives. With giggles, banter and heartfelt honesty they are encouraging us out of our dark little shells and into the sunlight one podcast at a time, safe in the knowledge that we are all facing the same mountains at one time or another. Thank you ladies, you’re doing a great thing. I’ve had this series in my library for ages and not listened. Then today I saw an episode called ‘quitting your photography business’ and I had to listen! Not because I’m quitting but because we all need added motivation sometimes and that’s exactly what I got!! The hosts are friendly, down to earth peeps who can imagine bumping into on the school run and Julie Christie who was today’s interviewee had so much advice to give, not just about photography but the life of a creative entrepreneur. Great listen and I’ll definitely now be catching up on all the episodes I’ve missed. Hurrah-delighted to have found you! Really easy listening with great quality content-keep it up ladies! Only found out about this a few days ago and I'm obsessed! I've been listening to quite a few podcast series and wasn't sure what to expect as I initially thought it might be too focused on family photography. I'm so happy to find that this podcast focuses on people photography, the behind-the-scenes of being a working photographer & creative business owner, having an entrepreneur mindset, having a female targeted audience, it's hosted by 2 awesome females with a fab dynamic between the two, loads of great inteviewees on different subjects, you just feel a part of the conversation. Fantastic job guys! Highly recommended this a listen folks! Wow. I am so grateful to have found this podcast! Such a helpful range of topics, great advice...too much advice as I now have HUGE 'to do' lists!! Exceptional banter by two ladies who are so easy to listen too as they are very engaging. Can't wait for the meet up! Informative, engaging, lighthearted and sprinkled with laughter. Making me feel a lot less crazy and better prepared to build a business I love, thank you! I'm really enjoying these podcasts - it's so lovely to have such fun company while editing or dog walking! Absolutely love listening to you both makes my editing much more enjoyable! I've been meaning to leave a review for so long. I tune in when I'm in my car or deep in editing mode, so it's taken a while. I thoroughly enjoy listening to your podcast - the relaxed chattiness is my favourite part. My next fave is your wide variety of high quality guests chatting about their zones of genius, with wonderfully random stuff thrown in. It's great not to feel alone in the frustrations of running a photography business, and I've picked up useful information with every episode. The only downside is that I always feel that I should have a glass of wine nearby, which would make for shocking editing. You're great company, thank you! I’ve learnt so much from these two lovely ladies! And I’ve had a giggle along with them too. Entertains me on the lonely days editing at my desk!! Such a great podcast to listen to, especially when you are editing and need something funny and easy to listen to. Keep up the good work ladies. No more lonely hours at my desk! I love this podcast! The topics are perfect and the hosts present the information so well! Inspiring guests and lots of useful tips. Thank you Vicki and Eddie for such an inspirational podcast. As a relatively new photographer trying to find my way into the professional world this is a fantastic resource, as well as interesting and funny. I love the range of interviewees and that questions are asked that really help newbies, such as which lenses people use and why. I’m really looking forward to the next series! Vicky & Eddie are entertaining and incredibly open and generous with their knowledge of business and photography. I'm absolutely loving this podcast and recommend for anyone interested in the business of family & portrait photography. Thank you for creating such a fun and helpful show! Great podcast worth subscribing to! These ladies are fun to listen to and have valuable discussions in a lighthearted & enjoyable manner. A must-listen-to for any portrait photographer! Such an interesting podcast and every episode has been spot on with the information shared. It’s like sitting down for a coffee with your fellow photographers. A Must Listen for EVERY UK Lifestyle Photographer!? Engaging, thought provoking, fun and informative. Will definitely listen again. I’ve listened to a few of these episodes now, and they’re interesting, informative, and also fun to listen to - it’s always nice when the presenters and guests sound like they’re having a good time! Really fun and informative podcast - look forward to hearing more. Enjoyed this pilot episode. A great sense of fun between these two passionate mama photographers! Looking forward to ep2 already! Really excited about this new podcast, it promises to be insightful & fun. I can’t wait for the next one!